Gold bars worth more than £10 million have now been recovered from the wreck of the British cruiser HMS Edinburgh which sank in 800ft of water off northern Norway in 9142. In the next few days, at least £35 million worth will be winched to the surface in what must be the richest treasure hunt of the century. For the past three days, I have been watching the recovery operation on board the diving support vessel Stephaniturm, and I find it hard to describe the excitement of seeing gold bars breaking the surface of the Barents Sea in consignments worth £4 million a time. They are being swung on deck in a large metal basket, then they are washed down with soap and water, logged and stored on a specially built bullion room. Each bar bears a number that identifies it as part of the gold bullion which was being sent to Britain by Stalin to pay for American arms in the Second World War. 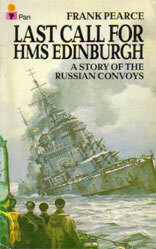 The Edinburgh, which was carrying it, was sunk by a German torpedo 170 miles north of the Russian port of Murmansk. By last night more than 100 bars, each weighing 23lbs and worth around £100,000 a time had been stacked on board the Stephaniturm. 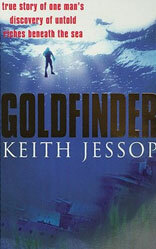 Once all the gold has been recovered, it will be taken to Murmansk where it will be divided up: 45 per cent will go to the salvage firm of Jessop Marine Recoveries, whose managing director, Keith Jessop, 48, is on board the Stephaniturm and who has become a millionaire overnight, two thirds of the remainder will go to the Russians, and one third to the British government. The man who found the first bar of gold was 2 year old diver John Rossier, who broke the news over the intercom at 10.48 on Wednesday night with the words: “I’ve found the gold! I’ve found the gold!” once on board, the single bar was handed to Jessop himself, whose response was simply silence and a broad grin of appreciation. That is the time he says he spent planning the ambitious scheme to locate the wreck and mount recovery operation using the latest space-age technology. Permission had to be given by the British government, since the Edinburgh is classified as an official war grave. The gold was recovered without disturbing any human remains, however.